We are pleased to share the spring dates for the Master Planner Courses in Community Planning, Zoning, and Zoning Administration taking place at the West Chester University Graduate Center. These courses are designed to help municipal officials and land use professionals navigate the rules that govern land use in Pennsylvania. There are no pre-requisites to take the courses and any citizen who is interested in land use is welcome to enroll. Classes begin at 6:30 pm and are accredited for continuing education for attorneys, engineers, realtors, appraisers and licensed landscape architects. This course is designed for new and veteran planning commissioners, local elected and appointed officials, and others, to learn how to carry out their responsibilities under the PA Municipalities Planning Code. Participants learn where the planning commission fits in local government, how planning commissioners relate to the governing body, zoning hearing board, the zoning officer, and other agencies at the county and local level. Topics include basic knowledge of the Municipalities Planning Code; the elements of comprehensive plans for municipalities, counties, and multi-municipal planning groups; the tools for implementing planning, including zoning, subdivision and land development, official map, and non-regulatory tools. Multi-municipal planning and implementation agreements is discussed. The course includes instruction in the Sunshine Act and how it affects planning commissions, and how commissions can become well-functioning organizations and a key adviser in local government development decisions. Hands-on exercises and discussions are built into each session. This is a nuts and bolts course that deals with probably the most complex and provocative topic in local planning. The course reviews how zoning evolved in the United States, and how many of the original concepts still form the basis of the way zoning is practiced in 21st century Pennsylvania. It stresses the fundamentals for developing a sound zoning ordinance using the authority granted in the PA Municipalities Planning Code. Among the topics in the course are the relationship of zoning to comprehensive plans; the key terms used in zoning and how they are applied; the critical issues in drafting a zoning ordinance and map; the procedures for adopting and amending ordinances, and; basic zoning administration. Also emphasized are advanced techniques like overlay zones, performance zoning, traditional neighborhood development, planned residential development, as well as the options available for joint municipal zoning. The course includes mapping exercises, reviews of ordinance provisions, and discussions of problem situations. This course is intended for planning commissioners, zoning officials, elected officials, and others interested or involved in zoning. This course is designed to provide zoning hearing board members, board solicitors, zoning officers, and elected municipal officials regardless of experience with the basic principles, procedures and information needed to effectively carry out their functions in the administration of municipal zoning ordinances. 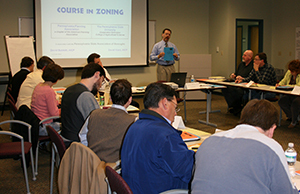 The course covers the technical aspects of zoning and how to build effective relationships with the public. Hands-on experiences and discussions are built into each session. Participants practice how to conduct effective zoning hearings in a mock zoning hearing session. Course topics include the principles of zoning; key zoning terms; the zoning administration team; zoning officer duties; enforcement notice procedures; key issues related to variances, special exceptions, and nonconforming uses, and; how to conduct a zoning hearing. Questions? Email info@cc2020.org; call 484-680-5570 or visit www.cc2020.org for quick, easy registration.